The age of standing meetings is upon us, and iMovR is leading the way with its Synapse line of adjustable-height conference tables. A high-capacity electric base paired with a 3D-laminated blade-edge table top makes Synapse both powerful and elegant. Grommet-mounted electrical modules power even your most tech-heavy meetings, and a wide range of height adjustment can support both sitting- and standing. Height range from 25" to 51", for both sitting- and standing meetings. 3D lamination gives table tops a sleek aesthetic, while maintaining its integrity against moisture and chemicals. 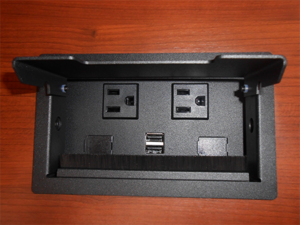 Power modules include AC outlets and USB charging ports for your devices. 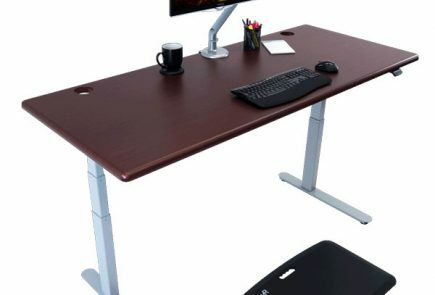 While iMovR offers some 1,600 configurations of the Synapse (4 shapes, 9 sizes, 16 top colors, two base colors, with or without power modules), the classic metal lifting legs, similar to those you'll find on 99.9% of sit-stand desks, may not match the decor of your office (or home) if it leans towards traditional versus modern styling. iMovR's Synapse adjustable-height conference tables pair 3D-laminated tabletops (available in four shapes) with the powerful Vigor base to create a world class sit-stand table. The Conference model features grommet-mounted electric modules so meeting-goers can charge their devices. 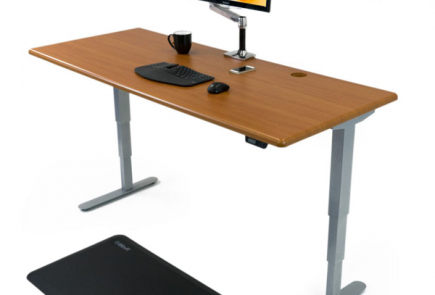 A wide range of height adjustment comfortably supports sitting and standing. The meeting: a necessary evil in most organizations. Most people feel meetings tend to run longer than they need to. Some in attendance will start to nod off, while others will fight to stay awake, wolfing down as much coffee and doughnuts as they can. During that inevitable moment in every meeting when the topic of discussion meanders down some irrelevant rat hole we begin to feel like we could be doing something more productive. Our legs just want to move, but they are trapped in restless chairdom. Blood sugar swings ensue. People start paying more attention to their mobile devices than what their peers are saying. Eventually someone in the group succumbs to narcolepsy and the meeting is mercifully adjourned. We’ve written at length before on the state of conference meetings. We stand with Dr. James Levine’s suggestion of moving the meeting out of its seat and onto its feet. Standing meetings are more productive and take less time, allowing workers to spend more time working and less time dying of boredom. As the popularity of standing meetings rises, one of the best weapons in office workers’ arsenals is the sit-to-stand conference table. Whether it’s for a quarterly departmental conference or a quick scrum, access to an adjustable height table can make a huge difference in productivity and wellbeing in most any organization. Which brings us to the new Synapse tables. Our colleagues over at iMovR have just introduced their new Synapse line of electric adjustable height tables as a more affordable alternative to their pricier kin, with some interesting new twists. The new Synapse Multi-Purpose Table starts at only $1,399, and the full-featured Synapse Conference Table starts at only $2,109. At prices like these the sit-stand meeting can be within reach of just about any company’s budget. We snuck a new buzzword in there on you. Scrum meetings have been growing in popularity in recent years, especially among tech companies. Such meetings are designed to allow teammates working on a project to meet and collaborate with one another in a highly productive and highly adaptive process. They last, by definition, no more than 15 minutes. Many departments will have daily scrum meetings to better synchronize their efforts on highly complex projects. A scrum table is a no-frills table designed for these quick and nimble meetings- and as far as we know, iMovR is the first to create one. To avoid turning scrum meetings in long affairs, they are typically held standing up. But look around the room and you’ll see people struggling to take notes on their iPhones, tablets, or laptops. According to iMovR, the idea behind their scrum table is to make it more convenient for participants to use their devices, thus making them individually more productive. But leave the power cords at your cubicle, because these simple tabletops don’t feature any power plugs or USB ports. For a 15 minute meeting, you won’t need them. Conference Table is designed with that in mind. 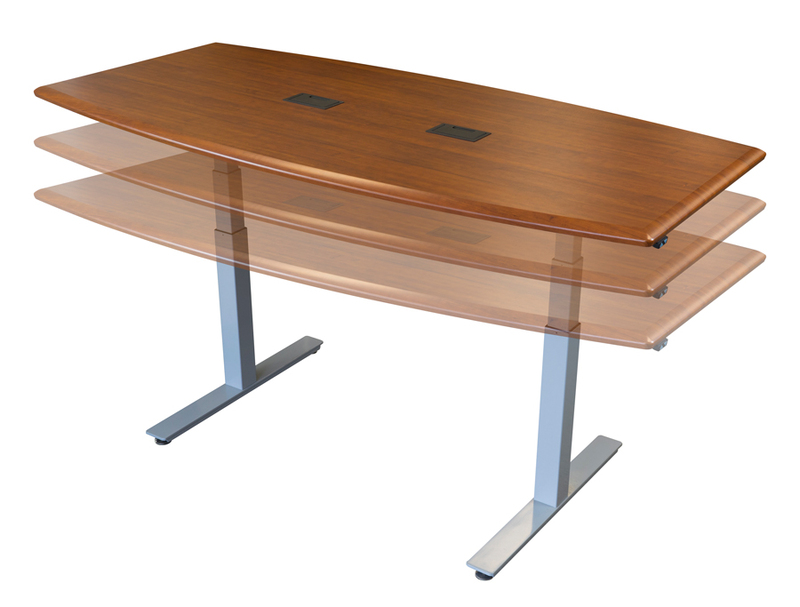 These tables feature dual, centerline-mounted, electrical modules. Each module contains two AC power sockets and two USB ports so no matter what kind of meeting or presentation you’re conducting, you can be sure that all your devices will be conveniently powered without having a tangle of cords tripping people up and knocking over coffee mugs. As treadmill desk aficionados we’ve had to bone up on a whole new lexicon of terms in starting to review conference tables. For example, the table top shapes most commonly found on conference tables are rectangular, oval, “racetrack” and “boat.” iMovR decided to introduce the boat-shaped table first. The boat shape’s popularity stems from the fact that it makes meeting participants on both sides of the table more intimate, without losing head count capacity. Rectangular, racetrack, and boat have recently been introduced by iMovR as well, offering plenty of options to please your organization's interior decorator. All tabletop shapes, including rectangular, feature smooth, contoured edges and corners that are comfortable to lean on when meetings run long. iMovR’s ThermoDesks are known for their 3D lamination, a technology that allows the tabletop to be computer-contoured with “ergo edging” and other features before the laminate is applied, leaving it with an appearance of being crafted from a single plank of hardwood. The Synapse uses the same ultra-durable Surf(x) 3D lamination technology as on the ThermoDesks, so you don’t have to worry about damage from any cleaning chemicals or spilled coffee. This is the same stuff that’s used to make cabinetry in medical environments, and it stands up to abuse much better than standard desk laminate products. The Synapse tables come in widths of two and a half, three and four feet, and in lengths of six, seven, and eight feet. There are 9 sizes in all to choose from, the smallest being 30”x72” – ideal for small meetings of 6 people standing or 4 people sitting – up to the largest at 42”x96." Like iMovR's standing desks, Synapse comes in a choice of 16 standard colors, and over 50 custom colors are available for bulk corporate orders – making it easy to match any décor you can imagine. Tables of this size require a stronger base than you typically see on a run-of-the-mill sit-stand desk. The Synapse’s heavy-duty steel frame possesses a whopping 490 lb lifting capacity, enough to handle the heaviest table tops fully loaded with laptops, projector, fruit platters and then some. The base is known as the Vigor, providing the Synapse with smooth and fast height adjustment at 1.7 inches per second. The Vigor's size strikes a fine balance: it’s wide enough to hold the large table tops firmly, without issues of stability; but it’s narrow enough to comfortably seat people around without the table legs getting in the way. One of the coolest things about the Vigor base is that by removing only four screws the legs fold down completely, making it super easy to relocate the desk or table to another room, or another building. 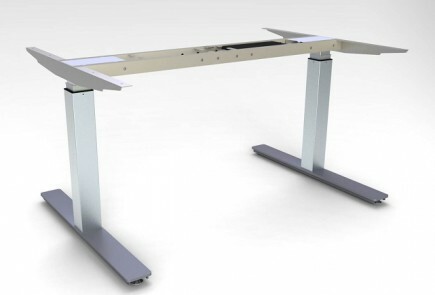 iMovR is still the only manufacturer of adjustable height standing desks offering factory pre-assembly as an option. With the Synapse, pre-assembly is standard. When the table arrives all you need to do is fold the legs up, insert four machine screws, and flip it over. That’s a huge plus over having to hire installers or do your own assembly work, as you must with most every other adjustable height table. Seeing as this is a whole new category of products altogether, we wanted to test the features and different possible use-patterns that workers may encounter with the adjustable height tables. We got to test the iMovR Synapse Multi-Purpose and Conference tables in 30”x72” configurations, which were ideal given that our team meetings usually involve no more than 6 people. After several months of use our observations boil down to two things that meeting leaders should be mindful of. First, most teams will include people with a variety of individual heights. Our team members ranged from 5’2” to 5’11”, and so we developed a ritual of spending a few seconds at the beginning of each meeting fine-tuning the table’s height to one that all found satisfactory. Second, the meeting leader will want to be sensitive to the first person who gets tired of standing and would rather revert to sitting again. This is usually pretty clear in people’s body language, but as soon as the first person starts dancing around like they’re walking on hot coals, it’s probably time to suggest bring the table down and rolling up some chairs. As standing meetings gain more traction in the workplace, an etiquette for sit-stand conference tables will emerge among offices that will provide even more answers to these kinds of questions. For example, the new class of “active chairs” such as the Back App, Mobis and Muvman are actually ideal for use with adjustable height tables. They’re more ergonomic than regular chairs, and for most people they have an adjustment range that can be made to work at sitting or standing height. At the very minimum we highly recommend sticking a basket full of inexpensive Mogos in the corner of every conference room that is equipped with an adjustable height table. Participants who’d rather lean than stand can pop up a Mogo “kickstand seat” in 20 seconds. If you want to go all out and fully outfit your state-of-the-art conference room consider replacing the old conference room chairs with a gaggle of Back Apps. Of all the active chairs we’ve tested in a conference room setting these were the most versatile for switching between sitting and standing, and the most highly rated aesthetically as well as ergonomically. 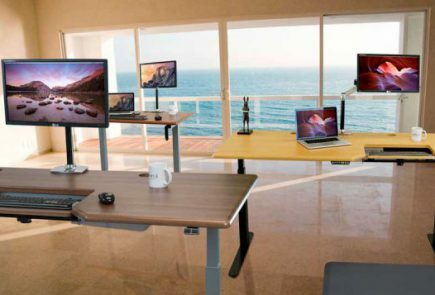 Adjustable height tables – and standing meetings in general – are still in their nascent stages, and we can only guess how these types of workstations will affect the office landscape. But the new Synapse Multi-Purpose and Conference Table are ahead of the curve, and lead the way to a more active and ergonomic method of meeting and collaborating in the workplace. Height Adjustment Range 25" to 51"
Width Adjustment Range (space between the feet) 44" to 71"
Standard options available for all desks, non-standard options available for large, custom institutional orders.